New Price! 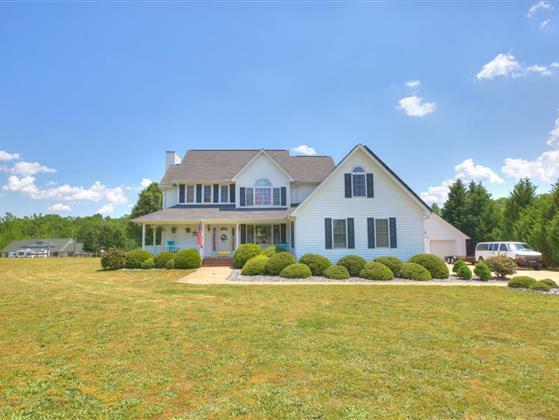 Have you seen this home on 5.39+/acres!! Remodel allowance $10K paid at closing! This lovely traditional style home boasts a large wrap around rocking chair front Porch! This property has 5.39+/- acres and the "Rocky River" runs across the rear edge of the acreage. Lots of space in this 4 Bedroom, 2 full and 1 half Bath home. Formal Dining Room , a large Family Room with a fireplace and gas logs. A 4 season Sun Room with 3 walls of windows. The Kitchen has a center island with a sink and a separate Breakfast area. The Master Bedroom Suite is on the Main level and has double sinks and a stand alone shower. The Bonus Room has it's own walk-in closet and a room just for your Office. The 25' x 16' covered Deck looks out over the back acreage. The detached 2 car garage is great for your extra vehicles, tools and toys!